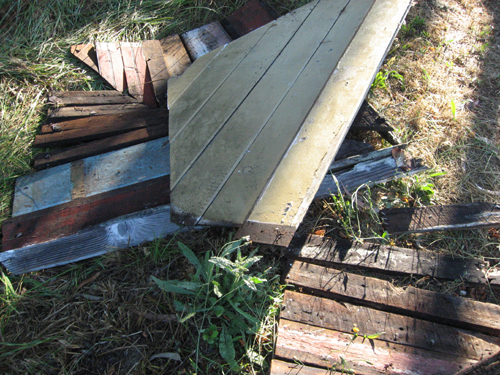 THE WRECK OF THE BURGESS BUS STOP: CAN THIS BUILDING BE SAVED? I am so amazed, and so filled with elation, that as of tonight, 128 people have signed up to learn more about the doings of Missionary Independent Spiritual Church. My days have been spent working out plans for the little church building itself. I know that some of you think it is too small to be of much use, but it is just right for me, right now. I love the building, and i would not change it for the world. On June 8th, 2006, Don Roach poured the concrete pad on which the building will rest. He left a circular hole (made with a piece of stove pipe as a form), in which i will inter my mother's ashes. That interment will be the first ceremony held on the site, and will be held on the anniversary of her birth, which was June 12th, 1915. And now, believe it or not, i am going to talk to you about paint. I know, it sounds strange, but if you like the Lucky Mojo, you know that graphic design -- as on our labels -- is one of my interests, and so, just bear with me. This is all about making pretty things. Now, i grew up in California, and when i was a kid, the whole "Wild West" fad was on in popular culture -- all those radio and television series about the West were on, like Gunsmoke and Have Gun Will Travel and The Lone Ranger (these three were on both radio ad television), and Rawhide, The Cisco Kid, Fury, Sky King, Maverick, Tombstone Territory, The Rebel, Bonanza, Bat Masterson, Branded, The Rifleman, Wagon Train, Cheyenne, plus the Disney series Zorro, Texas John Slaughter, and Spin and Marty. Growing up in the west, i learned about the Gold Rush, and the Missions, and such like. In school i knew a number of Chinese kids whose families had been part of the Gold Rush. My father was a 2nd generation Sicilian immigrant and my mother was a Jewish refugee from Germany, so i knew that even thoug i had been born in California, i could never join the Native Daughters of the Golden West -- but i thought that the stories about the Gold Rush and working on the railroad that my Chinese friends told me were very cool -- certainly as neat as having had a cowboy or an Indian in the family. My parents, although they had no Cowboy or Indian or Gold Rush memories to pass along to me, liked camping out, and so during the 1950s we travelled through the Golden State during the summers, going from hot spring to hot spring, Mission to Mission, and ghost town to ghost town, sleeping in state parks, and scouting bookstores for rare volumes in out of the way locations. In those days, there were a lot more abandoned or semi-derelict towns in California than there are now, old towns like Volcano, Fiddletown, Copperopolis, Rough and Ready, Jimtown, Caspar (the Friendly Ghost Town), and Mendocino (population 385). In 1961, when my mother came into some money due to the death of one of her uncles, she bought an old house in Mendocino, and we began to spend our summers there. In the town there was also a funny little building called The Joss House. Joss is an Anglicization of the Portuguese word Dios or God. The town of Mendocino had mostly been settled by Portuguese fishermen, and to the Portuguese, a Joss house or "God house" was a friendly but not too respectful way to refer to a Chinese Taoist temple. The temple -- well, we called it the Joss House -- was owned by the Hee family, descendents of Chinese folks who had come over to take part in the Gold Rush. The Joss House was a wreck, really, but i loved that little frame building, built in 1852. It was green and red -- a dark rust red and a flashy green. Inside there were Chinese things, very old, and for a quarter, the Hee kids would let you take a look, behind the lawnmower they stored there. Times have changed. In the 1980s, Lorraine and Loretta Hee, who are about my age, took the building in hand and got it declared a historical landmark, which it truly is. 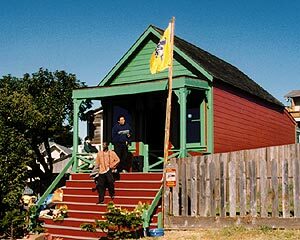 My mother was very proud of Lorraine and Loretta as the Joss House went from being a strange oddity in the Hees' side yard to its current status as the focus of a non-profit organization dedicated to cultural understanding of the Chinese role in the early settlement of California. There were a lot of Joss houses in California at one time, and some still survive -- one in Weaverville, one in Auburn, one in Nevada City ... and there were Chinese herb pharmacies out in the Gold Country too -- in Fiddletown, and in Auburn. All of these buildings featured a lot of red and green and gold. Green doors, gold ideogram signage on rust red sign boards, gold ideograms on olive green signage, red walls, red and gold cloth, gold lettering on red mahogany woodwork, red and yellow paper lanterns, red and green and yellow painted glass lanterns, and flashes of black, blue, and pink to liven up the decorative nature of the furnishings. 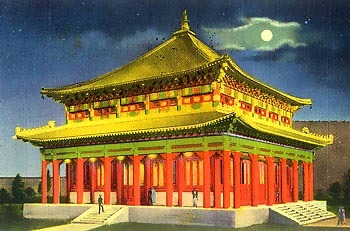 Another red, green, and gold Asian temple building i have always liked, although i have never seen it except in pictures and old postcards, is the Bendix Lama Temple at the Century of Progress Chicago World's Fair in 1933. I know, that's a confluence of nomenclatural concepts that requires explication, for sure. Some of you old-timers know The Lama Temple as a brand of spiritual supplies marketed out of a store on South State Street in Chicago that is now co-owned by Marty Meyer of Indio Products, who owns most of the old-time hoodoo product names and lines. Well, that spiritual supply company took its name from the popular 1933 Chicago World's Fair attraction called The Bendix Lama Temple. After the fair closed down and the Lama Temple itself was removed, the company kept the name. 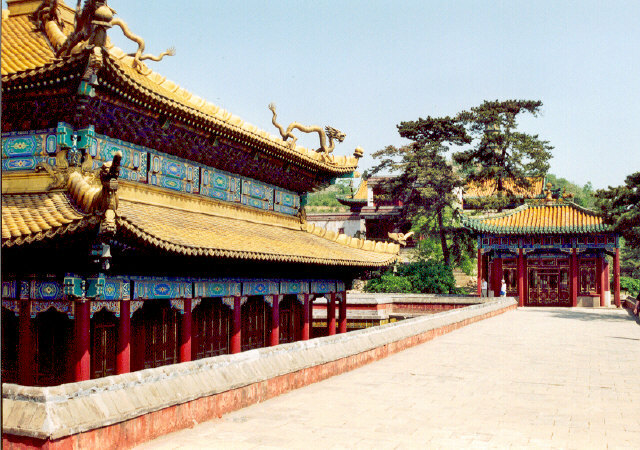 The Bendix Lama Temple was not an actual Tibetan lamasery temple. It was a lot stranger than that, actually. A Swedish explorer, ethnographer, and writer named Sven Hedin (1865-1952 -- and a great favourite of my mother, during her youth) had been travelling through China when he "discovered" an architectural oddity in Chengde (also known as Jehol, and now known as Rehe), a rural area outside of Peking (a.k.a. Pekin, Peiping, Beiping, or Beijing -- the capital of China). In the midst of the usual Chinese buildings, there was an 18th century temple compound built in ancient Tibetan style, and the temple was staffed with "imported" Tibetan monks. It turned out that way back in the 1700s, the Emperor of China had greeted some emissary monks from Tibet and he liked their teachings so much that he invited them to stay in Peking as his guests. One could not refuse an invitation of this nature, of course, but after a time the monks told the Emperor that they were pining for the cold weather of their homeland and that Peiping was too hot and dusty for mountain men such as they. Perhaps they hoped the Emperor would send them home out of pity, but if so, they were disappointed, for he decided to build them a permanent home in the coldest and windiest place within convenient travelling distance from his Imperial Palace, so that he could visit them at his leisure, the way a modern urban family might visit the polar bears in their air-conditioned house at the zoo. According to the Emperor's decree, a Tibetan theme park of sorts, the Jehol Potala, was created at Chengde. It was built by imported Tibetan laborers, and furnished with the most sumptuous of Tibetan religious ritual tools and iconography, including priceless statuary and enormous hand-painted tankas. What Sven Hedin, the intrepid Swede, "discovered" therefore, was a very old tourist attraction -- a Chinese working replica of a Tibetan monastery called the Golden Temple or Potala of Jehol. This was significant to Westerners, because altyhough Hedin himself travelled to Tibet, at a time the nation itself was more or less off-limits to foreigners, and few people knew what artifacts from Tibetan culture looked like. 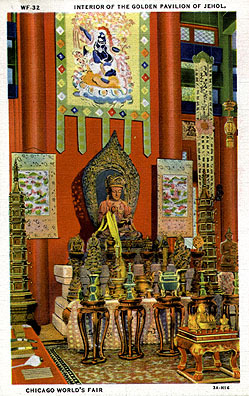 Hedin convinced Vincent Bendix, the Swedish-American owner of the Bendix Watch Company, to fund the building of a full-scale replica of the Chinese replica "Lama Temple" in China and to ship it, piece by numbered piece, to Chicago, for reconstruction and exhibition at the World's Fair of 1933 - 1934, as an advertising promotion of the Bendix Watch Company. And so it was done, all according to Sven Hedin's plans, with Vincent Bendix's funding. Dr. Gosta Montell oversaw the collection of ritual implements and furnishings for the interior. Crafts labour was supplied by Chinese artisans, including Hwa-ting Shun, Ping Chen Chang, and the architect Kuo Yuan-hsi. The building's roof was simplified a bit for its American reproduction -- the eight gigantic golden dragons on the Chinese Potala of Jehol were represented by four smaller golden dragons in Chicago -- but since virtually no one in America had ever seen the Emperor's lamasery theme park in China, the effect was still stunning enough to blow a few hundred thousand minds in Chicago under the official title: "The Chinese Lama Temple, Potala of Jehol: Exhibition of historical and ethnographical collections, donated by Vincent Bendix." After the World's Fair closed, the Lama Temple building was disassembled and rebuilt in New York for the 1939 - 1940 New York World's Fair. It was then to be shipped to Sweden, where Sven Hedin planned to rebuild it again, but World War Two intervened and for a number of years the temple was stored at Harvard University and at Oberlin College in Ohio. The contents of the building -- the replicas of the ancient statuary and the painted tankas -- were scattered, some distributed among Vincent Bendix's descendents in Sweden, some ending up in the Jacques Marchais Museum in Staten Island, New York, some staying at harvard until returned to the Sven Hedin Foundation and the Museum of Ethnography in Stockholm, Sweden, and some -- principally the portion stored at Oberlin, destroyed, lost, or dispersed in private collections, having never turned up on the antiquities market to this day. I love the multiple regression of the Jewish-owned Lama Temple Products Company manufacturing spiritual supplies for African American root doctors under the name of the fake Chicago Lama Temple that was based on the fake Chengde Lama Temple that was based on a real Lama Temple somewhere in Tibet.